After re-introducing the Arc-Zone Monster(tm) TIG nozzle last month I did a Google search and ran across a post from 2009. The reviewer, a new welder, had said the Monster nozzle was a monster waste of cash. (ouch!) Unfortunately, I replied noting that the picture shown was not, in fact, our pink Monster Nozzle, but was the white Champagne nozzle and that the nozzle was not installed with the Teflon(R) gasket needed for the “Stubby” front end parts. You can read the post and my replies on Ben’s blog …. but I wanted to make some additional corrections here, on my own blog– I had forgotten the history of our product. Starting in 2008, the company that manufactured our diffuser screen stack for us folded and we were unable to find a quality replacement. For a short time we substituted the Champagne nozzle, which was copied from Arc-Zone’s original Monster nozzle, so the exterior shape is similar. The difference is the Champagne nozzle uses a “white” ceramic material, and one dense stack of screens with a metal ring that is sized for the tungsten to pass through. The screens are held in place by a steel retaining wire, with a hook on it. We found that those items significantly reduce the available surface area and cause the gas to be disrupted as it flows around those obstacles. 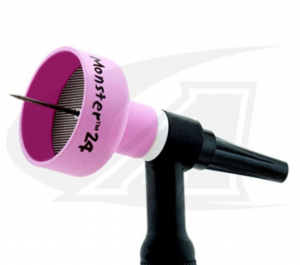 Ultimately we took our Monster Nozzle out of our web store. I wish Ben had contacted us back when he tried the nozzle–we have a No Hassle Return policy we’re very proud of. In fact, I’m offering Ben a replacement, even though more than 30 days have passed… that’s how much I believe in the quality of our Monster TIG Nozzle. We’ve now sourced a quality manufacturer and have re-introduced the Monster TIG Nozzle, and the Monster Nozzle Pro Kits. 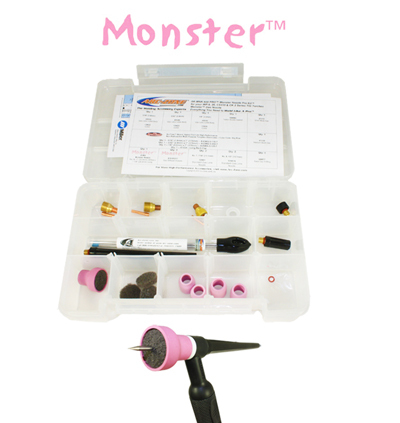 Kit includes a Monster Nozzle with diffuser bisket, a verified-quality gas lens collet body, collet and Teflon gasket. You can select the tungsten sizes you need for your application, and your torch model– 2, or 9/20 series or the 3, or 17/18/26 series TIG torches. Kit includes a Monster Nozzle with 3 diffuser biskets, a range of verified-quality gas lens collet bodies, collets, a Teflon gasket, long, medium and short back caps with spare o-rings– Plus a couple standard gas lens nozzles for those every day jobs. Also included is our ArcTime™ Hyperformance All-Purpose Non-Radioactive Rare Earth Tungsten Electrodes. Pro Kits available for the 2, or 9/20, and we offer a Pro Conversion Kit for the 3, or 17/18/26 series TIG torches. I manufacture mountain bike frames using Reynolds 631 tubing, in a shed in the UK. I already use a gas lens and have all the sizes I need, so I was wondering if its possible to get a kit without the lens? Thanks Burf! We don’t currently build kits without the gas lenses, but we do sell all the parts open stock – You would only need the cup and biskit and they are available in our web store. I just recently picked this kit up and was wondering what you guys recommend for gas flow? I’m usually at 10cfm but not sure how high to go since this kit includes a biscuit. Hi Robert, you’ll need to do some test welds to get it dialed in just right, but it should be somewhere between 12-15 cfh. Hope that helps, give us a call at 1-760-931-1500 if you have any other questions. Thanks! From the uk been useing some Pyrex size 12 cups find them very good but very expensive and prone to cracking. Would like to purchase your monster ceramic cups size 12 to fit a torch wp9 or wp20 can you help and also give me a price.